We are back with this week's App Tracker. Last time we showcased a few apps that bring out the hidden photographer in you and this time we have chosen three utility apps that we feel will make your smartphone a better device. With all the heavy apps installed on your phone, the battery dying must be a major pain. Then the constant use of internet puts the smartphone in danger of all those viruses lurking around. Add to that the fact that we install so many apps, half of them we don't use and they just use up the memory of the phone unnecessarily. Keeping all this in mind, we decided to feature three apps that will cater to these issues. So, we have one battery saving app, a memory cleaner, and an anti-virus app. Note that this is not a comparison feature; we have just tried to introduce some utility apps that will make your life easier. Also, considering there are many more apps available for each of these functions, for the purpose of the story, we selected the top apps in their category on the Android store. With all those apps on your precious phone, by now the battery must have gone for a toss. Many battery optimisation apps are available in the app store that can help in making the battery last a bit longer. Du Battery Saver app is currently the top free app in its section. The home page greets you with the number of hours your battery will last displayed in the centre of the screen with temperature, voltage and capacity listed under it, followed by a graph that depicts the battery discharge. At the bottom of the screen, there are various tabs. One of them is 'saver' that lets you choose the mode that you want to put your phone in. The various modes available are 'long' (that has mobile data off, SMS and call on to save battery), 'general' (call, SMS, mobile data - on; WiFi - off), and 'sleep' (clock, alarm - on, calls, SMS, data - off). Users can customise all these modes, and add more modes to the list. Next is the toolbox tab that just lists some app suggestions and will take you to the Google Play Store as you click on any of those apps. Then there is a tab that displays the battery (how much is left), and gives tips on healthy charging. Last but the most useful tab is the monitor tab where you can see which apps have been using how much battery and can stop them. The user interface is intuitive and easy to understand. Another handy feature is that of setting various reminders like low battery reminder, charge reminder, charge finish reminder and mode switch reminder. Users can also have an option to have these reminders on but switch off the alerts (for a particular time frame). 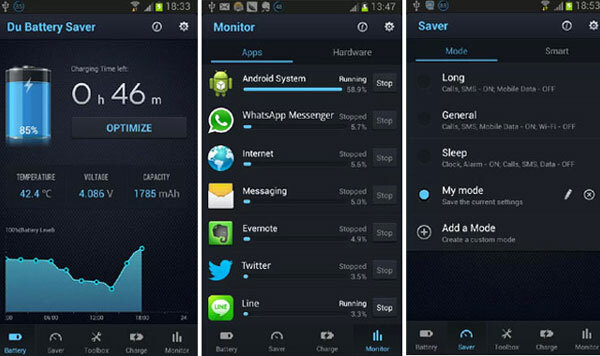 An optimise button when pressed automatically shuts apps running in background and increases the time of the battery. Takeaway: It is a decent app and will help your device's battery last longer. The optimise feature is especially good. The only glitch is that users might not even realise that they can switch off the alerts (can get a bit disturbing); so it should be added as part of the app tutorial. So after downloading all the cool apps we have been listing in the past, by now you must be short of memory. Clean Master is a cleaner for your phone memory, literally. It allows you to delete cached data, junk files, applications, and tasks via one interface and without many glitches. It is a free app with an easy UI. As soon as you open the app, the home page on top shows two pie-charts depicting the used and free memory on your SD card and the phone memory. Just below that there is a section that is divided into four parts—junk, privacy, tasks and app manager. When you tap on either of these four sections, the app automatically starts calculating the files that need 'cleaning'. From there on, either users can select to clean these files manually or the app can do it. However, it is advisable to clean the files other than junk ones manually so that important data is not lost. The app also gives suggestions on files that it thinks should not be removed. Other features include adding reminders for cleaning junk files and cleaning tasks as well. 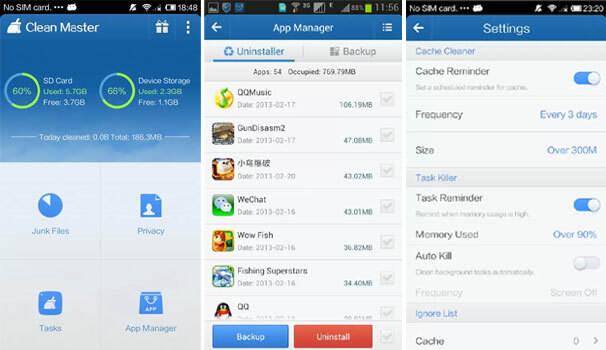 The app manager allows users to back up, uninstall or move the app from SD card to phone or vice versa. Takeaway: All in all it is a decent app that does the simple yet important task of cleaning the memory quite well. With all that important data, pictures and videos users have on their smartphones, logging on the internet throughout the day can get risky because of the viruses out there. Hence, an anti-virus is a must. Avast anti-virus stands out because of the multitude of features it packs, along with being a basic anti-virus app. There are features like anti-theft and data backup (both of these have to be separately installed). Application locking feature, which further has a lot of personalisation like which day what time you need to lock the app; and setting an Avast pin, gesture password or text password. Privacy advisor lets you see which apps are accessing what info on your phone and comes quite handy to know which apps have access to personal data. The feature meant for SMS and call blocking is also very useful. It can also be customised by date and time. Apart from these, there is the firewall and network meter and users can also manage other applications directly from the Avast app. 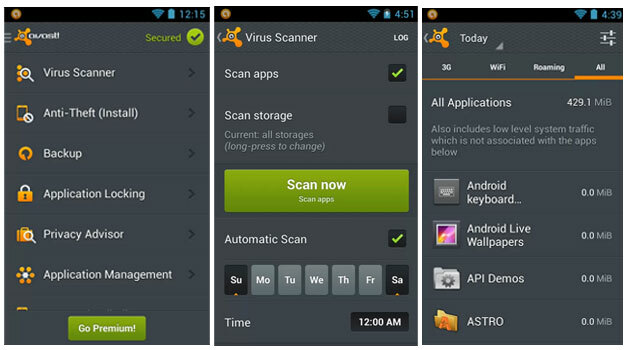 In terms of scanning for viruses, the app can scan other apps as well as the internal storage of the smartphone. It can also schedule automatic scans for a set day and time. The user interface is pleasing but a bit confusing at first since it packs in so many features (could take a bit longer to get a hang of the app). The home screen has all the options listed vertically starting from virus scan, anti-theft, backup, application locking, privacy advisor, application management, SMS & call filter, firewall and network meter. Takeaway: The app is very useful and though a lot of other free antivirus apps are available, it gives a lot more value added features. However, too many functions can get a bit confusing at times.